I have heard this book described on more than one occasion as "The Bachelor meets The Hunger Games." I'm sorry, but that is a ridiculous comparison. There is nothing even remotely like The Hunger Games going on in The Selection. You know what this book is like? The Bachelor. End of list. There's no "meets"anything . It's a royal version of The Bachelor. Period. And the world building? Pretty much non existent. I honestly don't even know what genre to categorize this book. I've seen many people call it a dystopia but there's just not enough world building for that to be plausible. Also, the audiobook narrator? She sounded like a slightly more animated version of Siri. I've never heard such a robotic audiobook narrator in my life. I'm surprised I was able to listen to the whole thing without attempting to press the home button and ask for directions or tomorrow's weather. Please pardon my snarkiness. 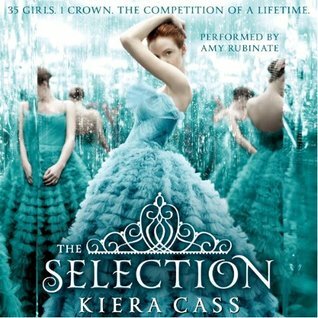 I did somewhat enjoy this book, kind of the way you enjoy a guilty pleasure but don't want to admit you really like it. That's me with The Selection. I will move on to the second book if for no other reason than to be able to talk about the series with the plethora of other readers I know who have enjoyed it. I, on the other hand, am just "meh" about it.